A boxing champion turned trainer who coached three world champions and inspired dozens of young boxers to reach for the top has been reunited with the local legend he steered to world title glory. Former Trinidad and Tobago featherweight champion Ronald Reginald Radcliffe Rodney Rush, known as ‘Ronnie Rush’, trained countless youngsters to boxing success over the years - including three former world champions. He set up his own boxing school, Ronnie’s Gym, in Ely, Cardiff, 25 years ago and was credited with turning around the lives of many disadvantaged youngsters. Now carers at The Forge Care Home, in Ely, a member of Care Forum Wales, have organised for his former protégé and WBO Featherweight Champion Steve Robinson to pay him a special visit. Ronnie Rush, 81, who has dementia, moved to the The Forge Care Home in Ely earlier this year and enjoys nothing more than to share his boxing experiences with fellow residents. His protegee, Ely-born Steve was trained by Ronnie from the age of nine when he was an amateur boxer and during the majority of his professional days including his eight title successes between 1993 and 1995 – and says the trainer taught him everything he knew. Steve said of Ronnie: “He’s been an inspiration to me and like a father figure,” said the 47-year-old, who lives in Cardiff. The pair are pictured meeting below and you can read more on this story in WalesOnline here. Boxing champ Steve Robinson said of Ronnie Rush: “He always knew I had the talent and pushed me all the way. He would knock on my door at 6am and take me for a run. He was always a world class trainer and we’ve shared some good times. Ronnie said: “It’s a great moment to see Steve. We go back a long way. They were really special days. Ronnie, who has 11 grandchildren and eight great grandchildren, started his early boxing career in the West Indies where he was born. He boxed professionally for 10 years alongside three other professional boxers who together were known as the “Calypso kids”. Ronnie moved to the UK in 1956 and continued to box professionally for a couple of years before retiring from the sport to help bring up his children. It wasn’t until one of his sons, Randy-Lee, said he wanted to take up boxing himself that he went back into the ring as a trainer. Among his other proud achievements is previously training Jane Couch MBE, who became the first officially licensed British female boxer in 1998 and who won numerous world titles, and coaching Welsh boxing star Barrie Jones. His original protégé Steve, who he trained for most of his career, was working in Debenhams as a store man in Cardiff when, with just two days’ notice, he accepted the fight against John Davison in 1993 for the vacant WBO Featherweight title and won the contest on a points’ decision. The defending Featherweight Champion, Ruben Palacios, who had been due to defend his title in Washington in Newscastle, had been stripped of his title after failing an HIV test and a new opponent was needed urgently to face Davison, from England. Steve, who retired from boxing in 2002 and now runs his own gym in Cardiff, said: “Very few people in Ely don’t know him. He did a lot for this area, not just boxing but because he gave the children a purpose and got them off the streets. “I was trained the old school way and although I have my own style, the way that Ronnie taught me all those years ago is the way I teach my boxers,” he said. Ronnie's daughter Juanita recently got a job as a carer at The Forge so she could be closer to her dad and help look after his needs. “Dementia is a very cruel illness. I see him struggle and it’s heart-breaking,” she said. “It robs people of so many things and whatever we can do to make their lives better and make a difference we do it. “We wanted to organise the visit from Steve to help my dad remember but also before his condition worsens to the stage that he doesn’t recognise people. Mario Kreft, chair of Care Forum Wales, praised staff at The Forge for making Ronnie’s day. 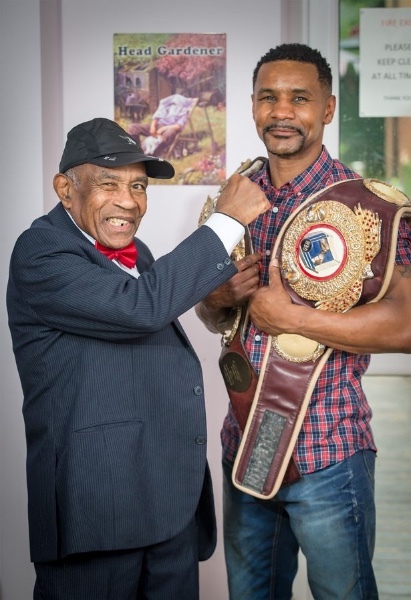 He said: “Clearly Ronnie has been an inspiration to the lives of many, not just former world boxing champions but also local children who greatly benefitted from his service to community life,” he said.